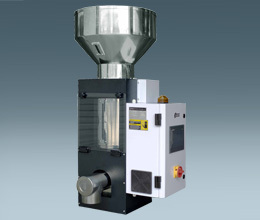 SLWF loss-in-weight feeders are suitable for starve feeding, especially for double-screw extruder applications with which the screws can be effectively saved and product quality can be greatly improved. Easy to used color touch screen. SIEMMENS PLC controller with P.I.D. control of motor speed ensures stable feeding. Screw is made of wear-resisting stainless steel to avoid material contamination. Adopt integrated screws design, different screw assemblies can be chosen to process different materials. Loss-in-weight principle is adopted in material feeding to achieve continuity, stability and accuracy. Material storage hopper is standard equipped. Ethernet communication is optional realizes regularly feeding and product quality controlling. Material suction assembly which including vacuum generator, vacuum hopper and relevant electrical and pneumatic components are optional. Multiple ingredients feeding control assembly can be opted to proportionally feed multiple ingredients. Multiple screw assembly can be opted to process different materials with different properties and throughput.